South Florida Real Estate Boom Not Dampened By Sea Level Rise Coastal cities are flooding more as sea levels rise faster and faster. But none of that is slowing real estate development in low-lying areas such as Miami. 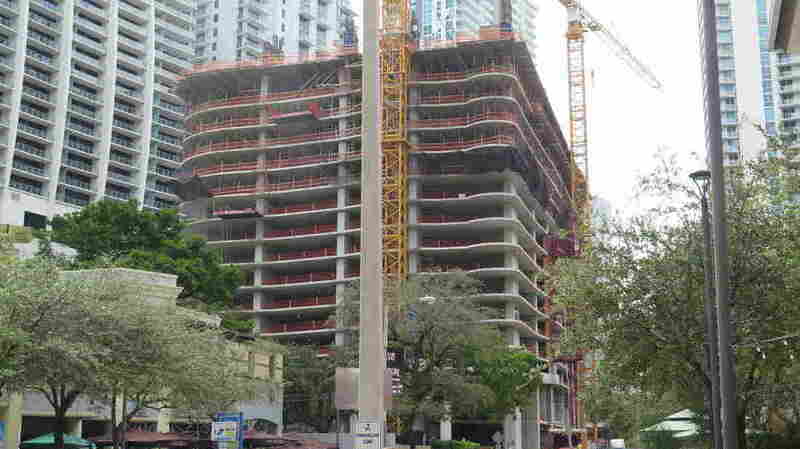 In Miami's urban core, there are some 20,000 condominium units in various stages of completion. But in South Florida, the dire predictions have done little to dampen enthusiasm for development. 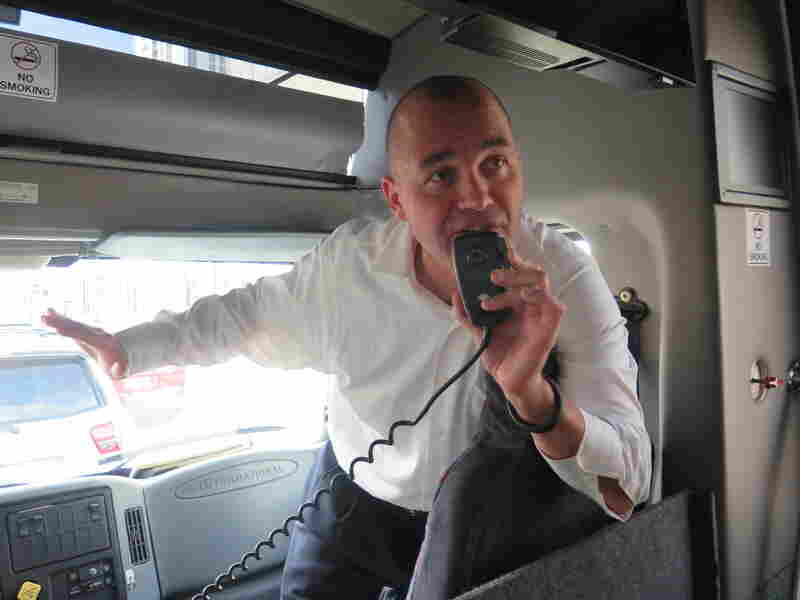 Real estate consultant Peter Zalewski operates bus tours for people interested in Miami's still-hot condo market. On a recent Saturday, he was leading a tour of 20 potential buyers — some local real estate professionals, others from Latin America. The bus tooled past blue-glassed luxury high-rises and work sites where cranes tower over partially completed buildings. Zalewski points out new and established condominium towers. "Right-hand side, we have the Bond at Brickell," he says. "Left-hand side, we have the 1100 Millicento. Straight ahead where you see cranes, we have the Brickell Flatiron." Miami's latest condo boom is on the downturn now, with fewer projects breaking ground and some canceling. One factor, Zalewski says, is President Trump's immigration policies, which have created uncertainty among foreign investors. But the market is still hot. In Miami's urban core, there are some 20,000 condominium units in various stages of completion. On the bus, potential buyers are rapt as Zalewski points out possible investment opportunities. He takes the tour group into one of Miami's hottest neighborhoods, the Brickell financial district. "You're going to have about 6,000 units right here on this street," he says. "That's why I call this the belly of the beast." Zalewski talks to the potential buyers about maintenance fees, property taxes and market conditions. One thing he doesn't mention and which no one asks about, is sea level rise and the potential in Miami for increased flooding. One of the people on Zalewski's tour, Michael Montalvan, manages properties for overseas investors. He says it's not a topic he's ever heard his clients bring up. "For people who come invest in a condo, they really don't care," Montalvan says. "You know, I've never seen an investor come talk to me about it at all." But Zalewski says most investors aren't thinking about what Miami might look like 40 years from now. "Chances are," he says, "they're not going to be in here long-term. Basically, they're looking to invest their money, look for a little uptick in the pricing and then dump it, take the profit and move on to the next play." For people who live in South Florida, sea level rise is hard to ignore. In Miami, the average elevation is just 6 1/2 feet above sea level. Some neighborhoods now see street flooding on a regular basis, whenever high tides coincide with a new or a full moon — so-called king tides. And that's not taking into account unpredictable events like heavy rainstorms or hurricanes. During Hurricane Irma, the storm surge brought waist-deep water into Miami's Brickell financial district, the neighborhood at the heart of the city's condo boom. But, Miami's Chief Resilience Officer Jane Gilbert says, because of the city's strong building codes and elevation requirements, when the storm surge subsided, there was relatively little damage. "What was most impressive about Brickell was how quickly it drained and people were back in business," she says. "Two days later I was walking down Brickell and I could have just hung out on the street at a table at a café and enjoyed my cafecito." "We need to have more pumps," Regalado says. "We need to have a better sea wall structure. What we saw with [Hurricane] Irma could happen again. And if it does, the damage could be in the millions and millions." "If you're already resilient to something that's going to be a foot, you're probably OK for a good 25 years over time," she says. "The sea is rising and it is rising at an increasing rate. But it's still rising at a relatively slow rate. So there's time for planning." As people become aware of rising sea levels and are affected by increased flooding, something has begun to change in Miami. Gilbert says she's heard friends begin to discuss the elevation of where they live and sea level rise as part of their long-term plans. "It's absolutely part of the conversation in the long-run," she says. "But right now, people aren't running. There's no rush. People can look at their elevation and make their own plans over the course of the next 30 or 40 years." In South Florida, no place is more vulnerable to flooding and rising sea levels than Miami Beach. That city is spending hundreds of millions of dollars to improve its infrastructure — raising roadways and installing pumps to better handle stormwater. And some developers are now following the city's lead. Despite predictions of a watery future, Michael Stern is one of many developers still bullish on Miami. Stern, with JDS Development, believes he's setting a new standard for resiliency with Monad Terrace, a 15-story condo tower. He proudly shows off the work at the tower's construction site, overlooking the water in Miami Beach. At this construction site in Miami Beach, crews are using a technique known as soil mixing to create a watertight basement and parking garage. "You see all these dump trucks coming out? We're injecting grout, concrete into the ground, replacing the soil with concrete," he explains. One of the reasons South Florida is so susceptible to rising seas has to do with its geology. The bedrock in South Florida is porous limestone, which allows groundwater to rise at the same rate as the ocean. 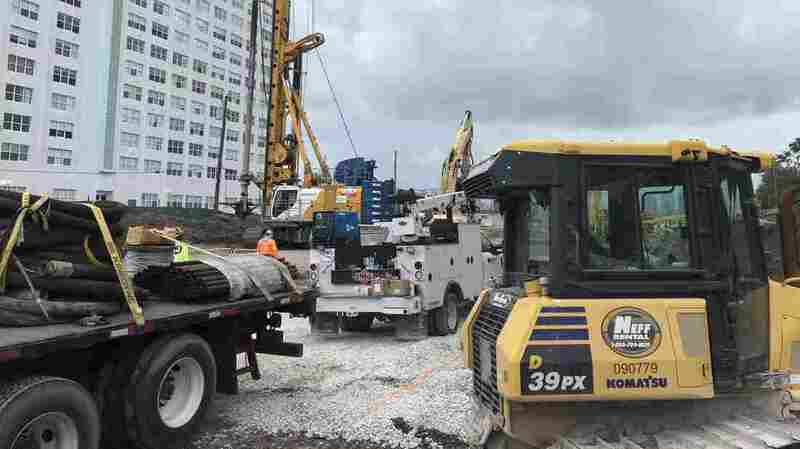 At the construction site in Miami Beach, crews are using a technique known as soil mixing to create a watertight basement and parking garage. "We are injecting basically what's called deep soil mixed piles of concrete that interlock with each other and form a continuous concrete bathtub. So no water can come through that porous limestone base up into our basement," Stern says. He believes eventually, this type of waterproofing will become standard for all new construction in South Florida. His condominium building is resilient in other ways, too, with a first floor more than 11 feet above the current road level, extra capacity in its stormwater retention system, also extra emergency generators. Stern used similar construction techniques for apartment buildings recently completed in lower Manhattan, another area vulnerable to flooding. Building in coastal areas like Miami Beach will continue to bring challenges, he says. "But I believe in human innovation," says Stern. "I believe that we're going to able to make the adjustments that are needed to say in the places we love long-term."